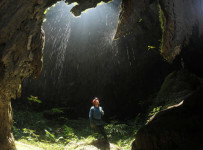 After years of study the Khe Ry – the expedition confirmed this is the longest river cave in the world. Said Mr Howard Limbert, cave expert of British Caving Association, on 26th of May , 2013. Khe Ry cave (means the river in cave named Ry) was surveyed in 1997. At that time the cave expedition of British Caving Association which was led by Mr. Limbert found that this river in cave were 13.8 km lenght . In subsequent years, the expedition continued to explore and added more information, photos and maps. In the year 2013, expedition has discovered this rivers in cave were nearly 20km lenght and they has confirmed that this was the longest river cave in the world. 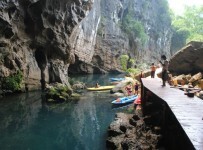 The cave’s ceiling is 120m height, so boats can flows at some stage of the grotto quite comfortable. The first water source of Khe Ry river is a stream at an attitude of 1,300 meters flows into the cave, forming long river, which runs to the En cave, then dives down on Son Doong cave and pours into the system of Phong Nha cave . May be, there are still hidden things in the Phong Nha – Ke Bang limestone has not been discovered yet.